I notice both cars in the pics are 2 totally diff cars ones a m6 n the other is a 650 with two diff interior pics? Last edited by Derboy; 02-18-2018 at 12:07 PM. The part number quoted on the first post is the one that I was given by my local dealer and is on the invoice. When I gave them the part number for my screen they found the corresponding back mount for me. Have you spoken to your local dealer parts department? Last edited by Derboy; 02-18-2018 at 03:50 PM. Thanks I figured it out based off the screen part number as you suggested. 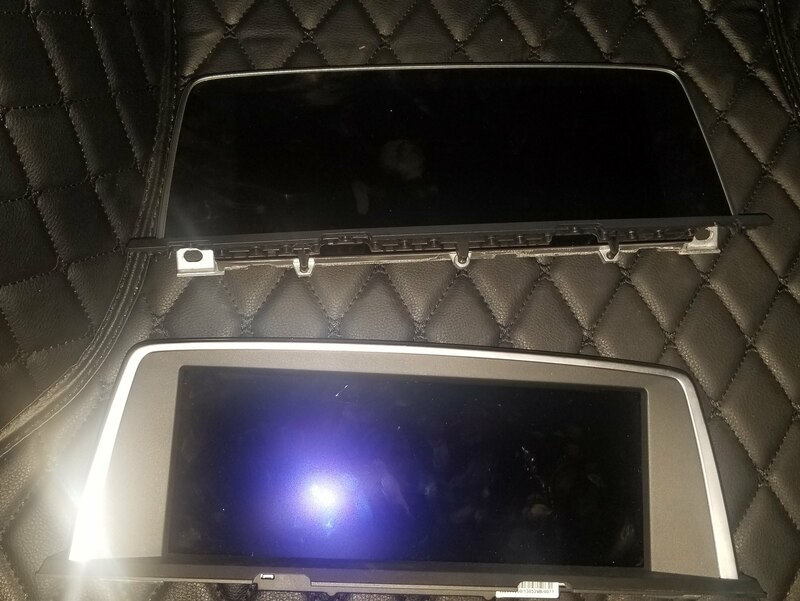 Only thing I can't believe is that this company sells the screen for $300.00 dollars US and BMW sells the screen with same part number for $2,200 dollars US. You said it's the same screen and you have it working in your car no issue? No I didn’t say it’s the same screen that I had. What was there to figure out? I gave you the part number in the first post. I think I’m done with this thread now as there's really nothing more for me to add. All the info provided is pretty clear and I’m going round in circles answering questions from people who haven't properly read the thread. Last edited by Derboy; 02-19-2018 at 11:22 AM. I understand your frustration. All I was asking was that it was a great deal for the screen and that Bmw charges a ton more for the same screen so I was asking you about the quality of the screen. Thanks for all your info and I ordered the parts. If anyone wants the back plate I have an extra one. The screen I purchased came with the original as my screen came off of a totaled 650i. Thanks to this thread got new screen today from China and installed. Only problem is back plate from dealer doesn't fit this screen. So it's not OEM fitment? How did you install it if the OEM backplate didn't fit? The new screen is OEM fitment. I tried going to BMW dealer with part number for back plate that was listed by original poster and they could not find part and searching the part number on ww.getBMWparts.com and tried to have my local dealer ordered for me what I found there is still for pre LCI screen. I assume because original poster of thread is in another country the part number provided is different. I just need to know for sure what is the correct part number for the back plate here in US for the LCI screen that was discussed in this thread. As far as how I got it to fit. The new screen bolted in the same mounting location just the back plate did not snap together and line up so for now there is a slight gap between the screen and back mounting plate. Which could be seen looking in from windshield only. What is part number of back plate piece you have ? Though I no longer have it as I just sold it to another forum member. Edit: I think this part number is for the screen with a TV tuner on it. I'm not sure which one is the correct part number for the other screens. Last edited by rsuhandy; 03-03-2018 at 12:53 AM. The part number I supplied fits my non-TV tuner version perfectly and was supplied to me by my local dealer who looked it up based on my screen part number. Surely people can just do what I did? Give the dealer the part number for her screen and ask them for the corresponding back plate as listed on their system. I just finished installing mine too and the back plate I got didn't fit either. Works for now but would like one that is flush. Here is the part I ordered. It seems to have extra vented plastic that is presenting the new screen from sitting flush. I went to 2 dealers to order back plate mentioned by original poster 65509364647 and it's not available anywhere in the world. That part no. of 65509364647 came from a main BMW dealer in Glasgow-UK and is the number on my invoice and the part itself. It was ordered in from Germany by the dealer and took around 5 days to arrive. So I don't know what else to tell you. The part supplied to me did not have those fins. Although like you, if it did I would have just cut them out as well. Easy job. thanks...does the trim piece by the steering column just pop off with clips? pull towards steering wheel?